How often do you check your real time monitoring results? I guess, hundreds of times during your business hours and I bet not only to see how many visitors are there on your website but also to check which pages they are browsing, where they came from and which key words they used. And what about Google advertising campaigns? Haven’t you always had a desire to check in real time if visitors came after clicking on your ads? 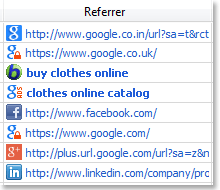 icons in Referrer column will let you know about that. And icon will show that a visitor came after using Google secure search. Icons for different social media platforms will help you to determine how successful your social media marketing campaign is and if your LinkedIn posts are read by network members. 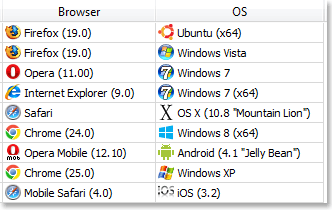 5.7.2 beta version has improvements not only in Referrers recognition, but also offers updated user agent parser which recognizes more browsers and operation systems, including Windows 8 and browsers and operating systems used on mobile devices. Our main goal is to provide you with modern software which will streamline your workflow and will help to offer high quality customer support service. We are always open to new suggestions and recommendations for improving our software. We are looking forward to your feed-backs! This entry was posted in News and tagged beta console release. Bookmark the permalink.